What are the Basics of Narrative Writing for Children in the Second Grade? Place as few restrictions on your child as possible when teaching storytelling. Writing stories is difficult, and so teaching narrative writing to a second grader requires extreme simplification of the storytelling craft. Furthermore, narrative writing is creative writing, and should be adjusted from the normal academic writing process. You still need to encourage correct grammar, brainstorming and editing, but the standard definitions of introductions, bodies and conclusions will confuse and restrict your child's storytelling. Instead, invite your second graders to lead with their ability to dream. Before beginning to write, your second grader needs to understand that every story needs a beginning, middle and end. The main character needs to go through an experience that causes a change in how she views the world. This change could be a lesson learned, or a simple loss of innocence. Regardless, the character needs to begin the story thinking one way, and then experience something that causes her to end up thinking another way. For example, if the main character thinks she's invincible at the beginning, she might try to do something -- such as climb the tallest tree, and then fall and get badly hurt. After she heals, she learns that she's not invincible and must be careful. A story doesn't need to follow the same structure as an academic essay. In fact, no two stories even need to be structured the same. Explain to your child that a narrative is made up of paragraphs, and that each paragraph needs to be clear, and well-written and express one idea thoroughly. Aside from that, your child can arrange the story any way he sees fit. For example, your child can structure the story chronologically, or begin near the end and tell the bulk of the story as a flashback. Furthermore, explain that whenever your child has a character speak in a story, those words should be placed inside quotation marks. Any time a new speaker speaks, a new paragraph begins. Your second grader also needs to understand that writing a finished story doesn't happen in one creative burst. your child will have to jot down ideas, and experiment with characters and plot events. After that, he will have to write an entire first draft, and then see if the story has any parts that don't quite make sense, or if the story drifts from its intended focus or uses several points of view instead of just one. Explain that good narrative writing -- just like other forms of academic writing -- means rewriting and revising the work until it is as good as it can be. 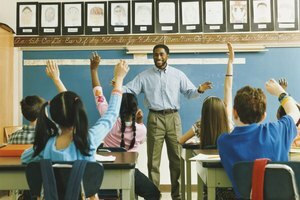 Descriptive language rounds out the basics of narrative writing at this grade level, and it plays just as important a role during revision as it does during drafting. When drafting, encourage your child to describe scenes vividly. Have him explain how things look, feel, smell and taste. Your child should also use description to signify time, and when events happen. For example, your child could signify that time has passed by using the phrase, "Later that evening, after the sun had set...." Also, when your child is editing the story, remind him to make sure that each descriptive word is accurate, and to search for a better word whenever necessary. Cascio, Christopher. "What are the Basics of Narrative Writing for Children in the Second Grade?" 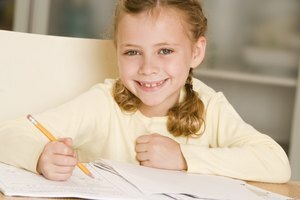 Synonym, https://classroom.synonym.com/basics-narrative-writing-children-second-grade-32672.html. 26 September 2017.